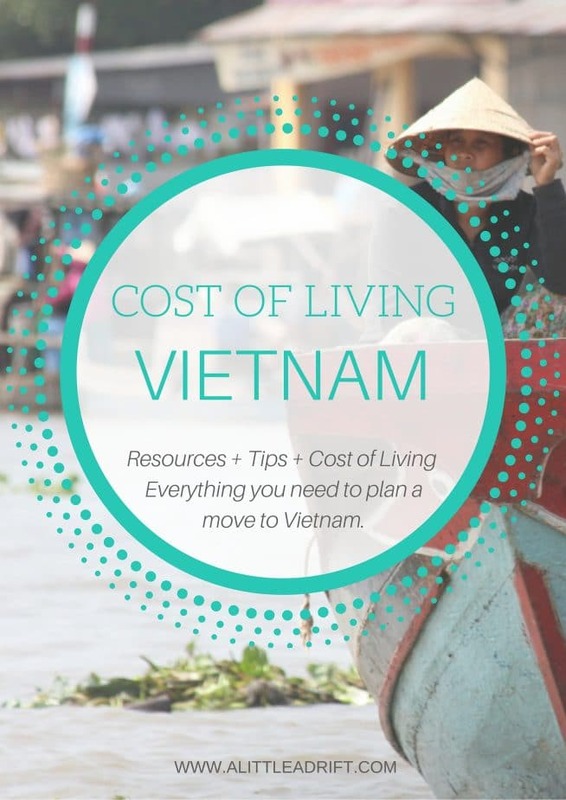 Vietnam Cost of Living — How Much to Live in Vietnam in 2019? Vietnam is a fast-growing expat destination, and one of the more popular places for retirees, expats, and digital nomads living in Southeast Asia. The country offers expats a quality of life that is, in many ways, better than that of neighboring nations. The food is diverse and delicious, the cost of living is low, and there are a number of well-paid teaching jobs available. Outside of the two largest cities, however, there’s also a lot to love in the country’s stunning beach towns and cool mountainside cities. Depending on where you choose to live, you’ll find a very different vibe. There is a large digital nomad and entrepreneur crowd living in Ho Chi Minh City. Many teachers work from Hanoi, in the north. And many American retirees who fought in the war returned to Vietnam to live out their days—they live in every nook and cranny of Vietnam. Visa policies are difficult for non-retirees, but they are not impossible. In general, the country is easy to explore and popular on the budget backpacker route of Southeast Asia. The legacy of the Vietnam war is noticeable. Many Vietnamese have family members living in the U.S. and they are generally friendly and welcoming to expats. If you have the privilege of moving and retiring abroad, Vietnam has a lot to offer in terms of culture and cost of living. Many expats considering Vietnam are looking for a place with a fascinating culture, good food, and a quality lifestyle on a budget. Vietnam ticks all of those boxes. While there are benefits to living closer to home, like expat spots in Central America, Southeast Asia has a lure all its own. Vietnam is generally safe from violent crime, with only petty crimes (like theft) an issue. The local culture and food are the two largest factors for many considering living in Vietnam. From north to south, a huge range of traditional dishes ensure you always have something new to eat. And as a primarily Buddhist nation, Vietnam offers a beautiful contrast of cultural holidays and religious rituals. Another reason to consider Vietnam is the varied landscape. Vietnam is stunning. It’s a very long nation; the climates vary hugely from a cold, mountainous northern region to a tropical, warm southern climate in the nation’s capital. The most iconic sites are quite touristy (think Ha Long Bay), but there are many other cities that are just as pretty but without the huge tourist factor. Which cities you consider living comes down to climate preferences, cultural nuances, and cost of living. The last factor for many expats is the lifestyle. It’s easy to find a job teaching English, and many expats living there will tell a tale of coming for a year and staying for life. Although transportation isn’t flawless, Vietnam’s mountains, beaches, and forests ensure that expats can take weekend trips to a variety of sights and into a variety of the countries regional cultures. Expat Scene: Vietnam is a popular destination with budget backpackers, travel bloggers, digital nomads, and young entrepreneurs. While there are some older expats and families, the majority of expats in Vietnam are in the 18-35 age group. Average Local Salary: The average monthly salary of a worker in Vietnam is about $148 per month; those in high paying jobs bring home around $500 per month. Visas: The most common visa for Vietnam is a single-entry three-month visa. However, six-month and twelve-month visas are also available, both single entry and multi-entry. Depending on your plans, it may be worth is to get a twelve-month multi-entry visa. Always ask for the visa to be attached to your passport as there have been instances where travelers with valid visas have been denied entry to Vietnam. Visit the Embassy of the Socialist Republic of Vietnam website for more information. If you’re visiting on a shorter visa, it can be easier to use an online visa agent. Pet Friendliness: Bringing pets into Vietnam is quite easy, and while you can hire a service to help with all the paperwork, it is a lot cheaper to do it yourself. Internet: High-speed internet is very common in large cities like Ho Chi Minh City, especially in cafes, is faster and more reliable than the high-speed internet in Thailand. Smaller towns also have internet access, but it can vary a bit more than in the two largest cities. Safety: Relatively safe. Petty theft is common, as well as scams involving taxi cabs, charities, and visas. Traffic is intense in big cities and motorcycle accidents are also common; it’s advisable to carry an insurance policy that covers such accidents. Possible Issues: Regional flooding can occur during the rainy season. Foreigners cannot own land in Vietnam; for expats hoping to buy and build a legacy, this is nigh impossible. While you can purchase a dwelling house, you must lease the land from the government. Water: Tap water is not drinkable. When you live there, you will buy reusable 19-litre jugs for about 10,000 VND. If you’re visiting on a reconnaissance trip, consider a SteriPen or LifeStraw. Child Friendliness: Similar to Thailand, Vietnam is very child-friendly. It is quite common for restaurant workers to entertain foreign children while parents eat. Don’t be alarmed, they genuinely love children, especially those with foreign features like big blue eyes or beautiful dark skin. Vietnam is quickly becoming a hotspot for digital nomads and expats in Southeast Asia. The low cost of living plays a major factor, and the deliciously cheap street food helps as well. Most digital nomads and entrepreneurs prefer to establish a base in Ho Chi Minh City, while expats and retirees prefer locations like Hanoi and Ho An. Vietnam is quickly becoming the most popular destination in Southeast Asia for digital nomads and expats. The low cost of living plays a major factor, and the deliciously cheap street food helps as well. Most digital nomads and entrepreneurs prefer to establish a base in Ho Chi Minh City, while expats and retirees prefer locations like Hanoi and Ho An. You will, however, find digital nomads and entrepreneurs in both those locations, but the communities are smaller. Another reason Southeast Asia is a hotbed of expat life: Short and long-term rentals are generally easy to find. This proves true across the region, from Thailand to Vietnam. When looking for a place to live, it’s a painless process. While Craigslist can be helpful, it is not necessary. Simply choose a neighborhood/district and walk around. You will find plenty of buildings renting rooms or apartments. There are also modern, Westernized condominiums in the larger cities. Similar to other Asian cultures, Vietnam culture if very family/ community-based. Some expats also use the affordable real estate agencies. Unlike in the West, these real estate companies also negotiate rentals and the fee is often minimal, with their fee coming out of the renter’s side of the price. In addition to the ease of simply getting set up over there, the food and culture is a huge draw. Street food is a fact of life in Southeast Asia, and on a Western budget, it’s very affordable. Note that the local wages are very low—$148 in some cases—and as such, prices are pegged accordingly. One of the drawbacks for older retirees is the lack of medical infrastructure. Though Ho Chi Minh City has quality hospitals, they are still behind nearby Thailand’s strong medical tourism industry, which guarantees high-quality medical facilities. For retirees with health concerns, this fact is a determining factor in choosing Thailand over Vietnam. Possibly the most popular destination among expats, Hanoi is home to a large expat community, many of whom are ESL teachers or work for NGOs. Similar to Chiang Mai in Thailand, there are western culture influences in Hanoi, making it easy to find international foods, as well as English-friendly businesses and health services. Many expats, even those in the south, prefer the vibe in Hanoi. The weather in the winter, however, is quite dreary and the lows are a cold, damp, 50°F (10° C). The city is less trafficky and congested, which many expats prefer to the rapid, chaotic pace of life in Saigon. One of Vietnam’s largest cities, Ho Chi Minh City (Saigon), is a go-to destination for young digital nomads, travel bloggers, and budget travelers. While you will find expat families living in the city, there are outnumbered by the digital nomads who covet the city’s cafes and speedy wifi. Popular areas for living are Districts 1 and 3. Other areas are cheaper, and further from the city centre, but if you’re keen to have a large community of expats nearby, you should focus on the two popular districts. Like big cities the world over, you will have access to a large number of expat amenities like expat grocery stores, expat restaurants, gyms, coworking spaces, malls, and a higher tier of housing if you are looking to splurge on a fully kitted apartment. Hoi An is a sweet town that is both less chaotic but still a very popular tourist destination. For that reason, you’ll find all the needed amenities such as wifi and expat foods, and also a community of digital nomads and expat entrepreneurs. As this small coastal town grows, the retiree community is also growing. Though it’s popular with tourists, expats can live just a bit outside of the city center and have a peaceful life in the rice paddies. It’s small enough that living outside of the city center is still a short, convenient drive or walk into town. The nearby beach also gets a big thumbs up for the quality of life. As a town, you have the quaint, pretty architecture, but still access to a beach and delicious foods. It’s an excellent small-town option if the two big cities don’t quite sound appealing. Being a smaller town, however, you will want to check your apartment’s wifi connection before you rent—while some have fiber optic connections, it can vary wildly. If you have a beach city in mind, the top spots for expats in Nha Trang City, . This spot has a long stretch of gorgeous beaches. It’s in southern Vietnam, so the weather is warm year-round but the coastal position makes it cooler than the city. And even more, it has a laid-back vibe that locals and expats love. Although there are some touristy spots, it is far less congested than Hanoi or Saigon, and the tourist-factor ensures that you can find expat amenities. Da Nang deserves a mention as it’s a beautiful spot that many expats love. The expat hubs are definitely the two main cities, but the beach-side life elsewhere is very alluring for many expats. There are few digital nomads and entrepreneurs in theses cities; the expats tend toward retirees and families. Da Nang is wealthier than many other Vietnamese cities, and the city is generally clean and quite modern. The weather in Da Nang is a huge selling point for many as it’s more temperate that Nha Trang. The range of delicious foods is reason enough for many to move to Vietnam. While restaurants exist, it’s really about the street foods. In fact, it’s nigh impossible to avoid street food in Vietnam, especially in cities like Ho Chi Minh where eating street food is a part of everyday life. Navigating the street food scene is overwhelming at first, but this Jodi shares an extensive post covering everything you need to know about eating street food in Saigon. Though she lists regionally southern foods, it’s also useful for street food in the rest of Vietnam, too. The national dish of Vietnam, Pho (pronounced ‘Fa’) is traditionally made with noodles, beef brisket broth, herbs, and chilies, however, if there are several other versions available that include chicken, tofu, or shellfish. Pho is best enjoyed at a street stall. Vegetarian pho is very difficult to find and you should never assume the broth at a street food stall is vegetarian, even if it’s a tofu dish. Vietnam is moderately vegetarian-friendly. In general, you can get by with saying chay before ordering. This tells local vendors to direct you to the vegetarian dishes they offer. But the concept of vegetarianism has wiggle room in Asia, and they will often assume you are okay with fish sauces and pastes. If you are vegan, there are options but you will have to work to find them. Happy Cow has an extensive list of restaurants throughout the country, and this is a good guide to traditional foods you can almost always order vegetarian. Vietnamese food is heavily based on rice and rice flour, making it easy for those suffering from celiac to find foods they can enjoy without becoming sick. Before arriving in Vietnam, download a celiac translation card in Vietnamese to make eating less stressful. All prices on the right are adjusted to form a best-estimate on the budget for a single person in that city. The case-studies, however, include a range of couples, families, and retirees. Additionally, most landlords offer rental discounts for yearlong leases. Several single expats in the digital nomad crowd report higher expenses than the rock bottom that is possible. In general, some of the digital nomad crowd, versus the expats or families, live in the trendier areas and splurge on a few extras. Areas for splurging include which district you live in, the level of westernization on the apartment, and A/C consumption. As more expats move to Vietnam, however, it is also driving up prices in local areas for expats and locals alike. When looking at the cost of living it’s important to understand that these estimates assume that expats will want many Western-style amenities. Locals live on far lower budgets, and as expats enter these cities they are often pricing locals out of the area. Each estimate is adjusted for a single person, but the case studies include families and couples too. Colin lives and works in Hanoi and has for a while, his last cost of living update in late 2017 shows a trend that many expats face, which is that they upgrade their lifestyle a bit after living on a tighter budget. So although his monthly expenses during his first two years time in Hanoi came in consistently under $800 per month. Now in 2018, he is sticking to $1,100 as his monthly budget—$600 of that goes to a really nice looking flat (a clear upgrade over the previous one that cost a mere $330), and he spends about $300+ for food every month. Amy and Andrew are British expats, who works as English teachers in Hanoi. They chose to live in the Ba Dinh district, near Hoan Kiem Lake. Their apartment came fully furnished with air conditioning and their building has a laundry room and a security guard 24-hours a day. As their apartment had a kitchen, they cooked most of their meals, instead of eating street food three meals a day. Their diet is vegetarian. To get around the city, they opted to rent a motorbike. Their life in Hanoi is pretty laid back, with massages and the occasional movie. They report a cost of living of $1,130 on average per month, with about $420 USD going toward rent. Jimmy is an Australian expat who lived in both Hanoi and Ho Chi Minh City over an 8-month period. A traveler and photographer, Jimmy works from cafes. And as a food-lover, Jimmy spends almost as much money on food as he does on rent. Instead of cooking his own meals, he decided to eat out three meals a day. In Hanoi, Jimmy decided to live in a hostel, which is not ideal for everyone. In Ho Chi Minh City, however, he rented a room in District 1 for about $280 per month. He reports a cost of living of $607 for an average month. This Hanoi site has a pretty fantastic, recent rundown of costs for living in Hoi An, including healthcare and schooling. It’s a good general overview. James is a single 30-something male. He lives in Saigon for the better part of each year, a home base when he is not traveling to other destinations. James is a travel blogger and digital nomad, and works from coffee shops. His monthly cost of living report came in at $724 for an average month, which includes a studio apartment in District 1. After rent, the majority of his expenses can be attributed to street food and coffee. This budget does not include alcohol, so if you partake then you will want to expand this budget a tad. Anna is an American expat who lived in Saigon for several months. She is an entrepreneur and quite active in the digital nomad crowd. Her cost of living report came in at $750 for an average month, which includes a studio apartment with maid and laundry service, and a yoga membership. Anna works mostly from coffee shops and coworking spaces, and she also eats out for every meal. David is a single 30-something male. He lived in the city for a long while and was an entrepreneur engaged in the digital nomad crowd and startup scene. His expense report came in at $1200 for an average month, which included his Western-style apartment in District 1, and a maid three times a week, alongside other optional costs. One example is his custom-made stand-up desk built for his apartment—very cool, but not in all expat budgets. He works from coffeeshops, which is par for the course, and doesn’t drink much. While on the upper end of the range for Saigon, his expenses are not extravagant. Danger and Stacey spent three months in Hoi An and they found a beautiful accommodation for $458 USD per month that was definitely Western style with a pool, fast wifi, and a location just near the river. Their food budget of nearly $450 is definitely enough to enjoy a good range of street food, nicer meals, and breakfasts at home. They detail every expense category in their video, as well as provide a comparison to Chiang Mai, Thailand cost of living for their lifestyle (navigate to minute 7:27 to see how they stacked up). It’s interesting to see that comparison because they live very similarly in both places, so can really get a feel for how your budget it either country might stack up. Their total costs for a couple came in at a cost of living of $1,251 per month. Simon and Erin are British expats and digital nomads living in Hoi An. They lived in Hoi An for two and a half months, and lived in a spacious two-bedroom apartment near Ancient Town. They are vegetarians and don’t party, and choose to spend their money on better accommodation and delicious food. Instead of partying they chose to have drinks at the beach, go to a movie, and take cooking classes. Their two-bedroom apartment cost $500, but they report smaller places run as low as $300 for a nice place—most rentals here are small houses. Motorbike rental came in at a reasonable $45 US per month. 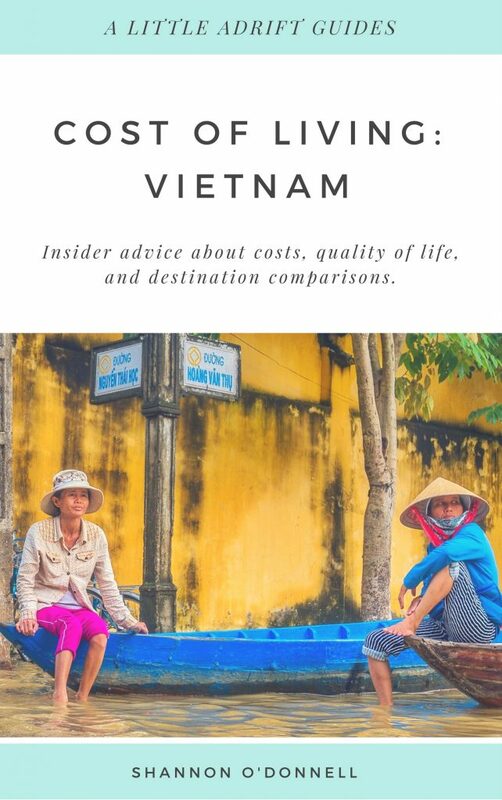 They report a averaging $1,292 for each month, which is incredibly similar to what the other Hoi An expat founds, so you know that you’ll likely come in similarly if you value the same lifestyle! Culture Shock: The Essential Guide to Customs & Culture: If you’re calling Vietnam your new home, consider reading up on the history of the traditions and customs deeply embedded into Vietnamese culture. This is an excellent crash-course of what you should know before you decide to move/travel there. A Better Life for Half the Price: A Mexican expat breaks down all the major expat spots in the world with costs, quality of living, and resources. I learned a lot and found a couple of countries I hadn’t previously considered. It’s worth buying if you’re still searching and comparing which country is best for the life you want to live. The Tax Book for U.S. Expats: This is well-priced and unique to expats and retirees filing abroad. It gives a granular look at forms, terms, and sorting out exactly how to file—good for those with complicated tax situations. More recently released, U.S. Taxes for Worldly Americans goes broader and is aimed at younger expats and digital nomads still working and handling how to earn income overseas, pay taxes, and live a nomadic life. It doesn’t explain the terms or niche situations/forms as well as the other book, but instead acts as a guide for younger travelers. Depending on your situation, pick up a copy of one of these guides before you leave so that you will have a tax system in place that maximizes the opportunities to easily file. You’ll also want property insurance once you’re living overseas—I’ve used Clements for many years now. Move to Cambodia: In case you’re weighing the thought of Cambodia, it’s a destination that is hard to find covered online, and this expat’s book is one of the best resources you will find. What Not to Do When you Get Dengue: Dengue is a real concern when traveling in Southeast Asia. This post by Jodi from Legal Nomads talks about her experience with Dengue, including what happened when she didn’t get treatment right away. Very informative. Why I Love Saigon: A fun post about the little delights of living in Ho Chi Minh City, useful information for anyone wishing to become an expat in Vietnam’s capital city. How Much Will I Make Teaching in Vietnam? : A good look at how much you can make if you move to Saigon and plan to work as a teacher. This post shares additional considerations for living in HCMC by an expat who has been there more than 15 years. Check out these FB groups and expat forums: Hoi An Expats, Expats in Ho Chi Minh City, Hanoi Expats. Planning a Research Trip to Vietnam? I highly recommend that you take a research trip to Vietnam before you decide to go through the process of moving your life there. Apply for a 30-day or 90-day visa. You can do this through the Vietnamese U.S. embassy, or it’s often easier to do the process online via an agent. If you’re keen to see a more local side to many cities, consider using Airbnb. The hotels below, however, can also make a fantastic central place from which you can explore. Pick out a good travel insurance policy like World Nomads (I’ve used them since 2008 and fully reviewed them here) to cover you while you’re either in transit visiting your future homes, or their insurance policies can work as long-term expat insurance too, at least until you sort out local providers. If you’re visiting Ho Chi Minh City, I recommend Tuan Long Hotel as a super budget option, or Liberty Central Saigon Centre Hotel for mid-range prices and accessibility to the places you’ll likely need to research. If you’re visiting Hanoi, it’s a small city so you can’t go wrong with most of the central places. I recommend Noibai Family Homestay as a super budget option, or Hanoi La Siesta Hotel Trendy for mid-range prices and good accessibility. In Hoi An, I recommend Green Garden Homestay as a for budget travelers, or Lantana Hoi An Boutique Hotel for mid-range prices and accessibility. Recommended Cultural Reading: If you’re hoping to fully immerse in the local culture, then there a few good books you should read. The book Catfish and Mandala is a beautiful memoir of about a Vietnamese-American’s overland bicycle journey. Having learned history from the U.S. point of view, The Girl in the Picture provides a beautiful, haunting look at the war from the Vietnamese perspective. And to round it out, The Sorrow of War is a memoir from a North Vietnamese soldier and provides a different perspective on the war and the impact that the war has even to this day.